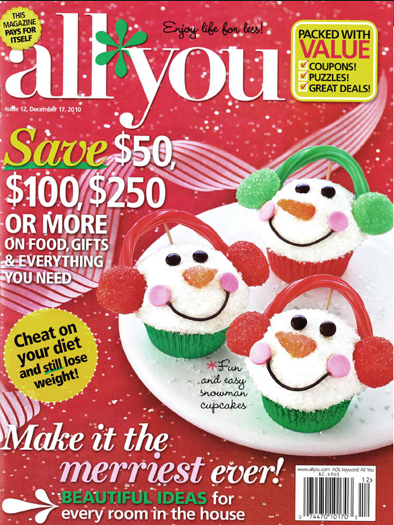 Pre-Black Friday Sale: ALL YOU Magazine Only $5 A Year ($0.42 Per Issue)! You are here: Home / Great Deals / Pre-Black Friday Sale: ALL YOU Magazine Only $5 A Year ($0.42 Per Issue)! WOWZA! Calling ALL YOU magazine fans! 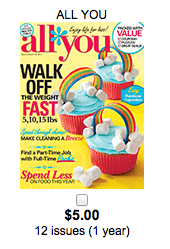 You can snag an ALL YOU Magazine Subscription for Only $5 A Year (that’s just $0.42 Per Issue)! And, if you are already a subscriber, you can do this deal and then give ALL YOU a call at 866-212-9065 to extend your current subscription. That’s what I am doing – there is just NO WAY I am passing up this deal! Hurry and grab yours before this offer ends on November 26 at 11:59pm!